VPNs have seen growing popularity as more people have become concerned about privacy and personal security online. They can also be used to sidestep national restrictions and allow users to gain access to websites and information which they are normally unable to. Whichever advantage of VPNs they seek, poker players have started to show an interest in this technology. Here you initially find a description of what exactly a VPN is and its benefits. This then moves on as I address a forbidden subject on many poker forums, the use of VPNs to log onto blocked poker sites from the US. There are perfectly legitmate uses of VPNs and US players can take other options that are cheaper and easier which you can also find here. Playing Poker Via A VPN – What Is A VPN? A VPN is a Virtual Private Network. 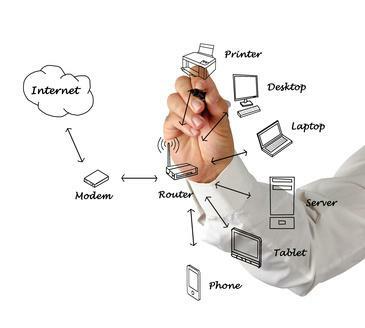 To form a VPN your computer is connects to another unit located elsewhere, so you can use the internet via the second computer rather than directly through your own. This allows you an extra degree of privacy as search engines and sites cannot detect your true IP address. It also provides you with added security, especially if you have the ability to connect to an encrypted VPN when using public hotspot. VPNs have really proved useful when they are based outside of the country you are in. This has allowed journalists and activists to avoid restrictions in repressive countries, it has also allowed the British to catch up with Eastenders via the BBC’s iPlayer when on holiday. In the aftermath of Black Friday many American players have wondered if they can use VPNs in a similar way to play online poker on restricted sites. Playing Poker Via A VPN – Can VPNs Be Used In The US? The short answer to whether or not you can use a VPN to play poker inside the US is ‘yes’. The technology is there for sure. The problem arises when you ask the question ‘should’ you play and what are the consequences of being caught. The major poker sites have not restricted US players by choice, it has been because the governments passing of the UIGEA has made it illegal to process gambling transactions online from inside the US. Some licenced sites, for example Bovada still interpret this differently and maintain a strong US presence, however the majority of major sites have now had no choice but to block US players. This is in order to protect their companies and future chances of doing business in an opening US market. While masking IP addresses may be fairly straightforward players tend to fall down when the physical address they provide the sites do not match up with the country where the VPN’s IP is. Even if this is possible, players still have to be able to provide foreign bank details relating to those countries in order to cash out. Finally they need to find a secure VPN which does not flag up as a known IP to the poker sites. This makes the entire process very hard work and expensive, and you still stand a chance of losing your entire balance and getting banned. Worst still, by following these lines you risk committing a felony and breaking international money laundering laws by getting around the UIEGA. Not all VPN use is by US players dodging the system. Many players use VPNs all over the world for their own legitimate reasons. If this applies to you all you have to do is contact your poker rooms support and explain your situation. You may still have to send them proof of your true location and IP address in order for them to protect themselves from cheating and illegal activity. If you are serious US player your money and time would be better spent looking to relocate rather than avoid detection. If this is not an option there are still reputable online poker rooms accepting US players such as Bovada.lv. This licensed Canadian based site has become the market leader for US players looking to play online, with quick deposits and withdrawals in addition to an excellent history serving their customers.